1 A None No Power Seat 1 A is a Business Class Bulkhead seat whose close proximity to the lavatories, galleys, and closets may be bothersome. The tray table is in the armrest, making the armrest immovable and slightly reducing seat width. There is no floor storage for this seat during take-off or landing. 1 B None No Power Seat 1 B is a Business Class Bulkhead seat whose close proximity to the lavatories, galleys, and closets may be bothersome. The tray table is in the armrest, making the armrest immovable and slightly reducing seat width. There is no floor storage for this seat during take-off or landing. 1 D None No Power Seat 1 D is a Business Class Bulkhead seat whose close proximity to the lavatories, galleys, and closets may be bothersome. The tray table is in the armrest, making the armrest immovable and slightly reducing seat width. There is no floor storage for this seat during take-off or landing. 1 H None No Power Seat 1 H is a Business Class Bulkhead seat whose close proximity to the lavatories, galleys, and closets may be bothersome. The tray table is in the armrest, making the armrest immovable and slightly reducing seat width. There is no floor storage for this seat during take-off or landing. 1 K None No Power Seat 1 K is a Business Class Bulkhead seat whose close proximity to the lavatories, galleys, and closets may be bothersome. The tray table is in the armrest, making the armrest immovable and slightly reducing seat width. There is no floor storage for this seat during take-off or landing. 14 A None No Power Seat 14 A is an Economy Class Bulkhead seat with extra legroom that LATAM designates as a Space + seat. The tray table is in the armrest, making the armrest immovable and slightly reducing seat width. There is no floor storage for this seat during take-off or landing. 14 C None No Power Seat 14 C is an Economy Class Bulkhead seat with extra legroom that LATAM designates as a Space + seat. The tray table is in the armrest, making the armrest immovable and slightly reducing seat width. There is no floor storage for this seat during take-off or landing. 14 D None No Power Seat 14 D is an Economy Class Bulkhead seat with extra legroom that LATAM designates as a Space + seat. The tray table is in the armrest, making the armrest immovable and slightly reducing seat width. There is no floor storage for this seat during take-off or landing. 14 E None No Power Seat 14 E is an Economy Class Bulkhead seat with extra legroom that LATAM designates as a Space + seat. The tray table is in the armrest, making the armrest immovable and slightly reducing seat width. There is no floor storage for this seat during take-off or landing. 14 G None No Power Seat 14 G is an Economy Class Bulkhead seat with extra legroom that LATAM designates as a Space + seat. The tray table is in the armrest, making the armrest immovable and slightly reducing seat width. There is no floor storage for this seat during take-off or landing. 14 H None No Power Seat 14 H is an Economy Class Bulkhead seat with extra legroom that LATAM designates as a Space + seat. The tray table is in the armrest, making the armrest immovable and slightly reducing seat width. There is no floor storage for this seat during take-off or landing. 14 K None No Power Seat 14 K is an Economy Class Bulkhead seat with extra legroom that LATAM designates as a Space + seat. The tray table is in the armrest, making the armrest immovable and slightly reducing seat width. There is no floor storage for this seat during take-off or landing. 20 A None No Power Seat 20 A is an Economy Class seat that may not recline due to the Exit Row behind. The close proximity to the galleys may be bothersome. 20 C None No Power Seat 20 C is an Economy Class seat that may not recline due to the Exit Row behind. The close proximity to the galleys may be bothersome. 20 H None No Power Seat 20 H is an Economy Class seat that may not recline due to the Exit Row behind. The close proximity to the galleys may be bothersome. 20 K None No Power Seat 20 K is an Economy Class seat that may not recline due to the Exit Row behind. The close proximity to the galleys may be bothersome. 21 A None No Power Seat 21 A is an Economy Class Exit Row seat with extra legroom, however, there may be limited recline due to the Exit Row behind. The tray table is in the armrest, making the armrest immovable and slightly reducing seat width. There is no floor storage for this seat during take-off or landing. The close proximity to the galleys may be bothersome. 21 C None No Power Seat 21 C is an Economy Class Exit Row seat with extra legroom, however, there may be limited recline due to the Exit Row behind. The tray table is in the armrest, making the armrest immovable and slightly reducing seat width. There is no floor storage for this seat during take-off or landing. The close proximity to the galleys may be bothersome. 21 H None No Power Seat 21 H is an Economy Class Exit Row seat with extra legroom, however, there may be limited recline due to the Exit Row behind. The tray table is in the armrest, making the armrest immovable and slightly reducing seat width. There is no floor storage for this seat during take-off or landing. The close proximity to the galleys may be bothersome. 21 K None No Power Seat 21 K is an Economy Class Exit Row seat with extra legroom, however, there may be limited recline due to the Exit Row behind. The tray table is in the armrest, making the armrest immovable and slightly reducing seat width. There is no floor storage for this seat during take-off or landing. The close proximity to the galleys may be bothersome. 22 A None No Power Seat 22 A is an Economy Class Exit Row seat with extra legroom. The tray table is in the armrest, making the armrest immovable and slightly reducing seat width. There is no floor storage for this seat during take-off or landing. The close proximity to the galleys may be bothersome. 22 C None No Power Seat 22 C is an Economy Class Exit Row seat with extra legroom. The tray table is in the armrest, making the armrest immovable and slightly reducing seat width. There is no floor storage for this seat during take-off or landing. The close proximity to the galleys may be bothersome. 22 H None No Power Seat 22 H is an Economy Class Exit Row seat with extra legroom. The tray table is in the armrest, making the armrest immovable and slightly reducing seat width. There is no floor storage for this seat during take-off or landing. The close proximity to the galleys may be bothersome. 22 K None No Power Seat 22 K is an Economy Class Exit Row seat with extra legroom. The tray table is in the armrest, making the armrest immovable and slightly reducing seat width. There is no floor storage for this seat during take-off or landing. The close proximity to the galleys may be bothersome. 23 D None No Power Seat 23 D is an Economy Class Bulkhead seat whose close proximity to the galleys may be bothersome. The tray table is in the armrest, making the armrest immovable and slightly reducing seat width. There is no floor storage for this seat during take-off or landing. 23 E None No Power Seat 23 E is an Economy Class Bulkhead seat whose close proximity to the galleys may be bothersome. The tray table is in the armrest, making the armrest immovable and slightly reducing seat width. There is no floor storage for this seat during take-off or landing. 23 G None No Power Seat 23 G is an Economy Class Bulkhead seat whose close proximity to the galleys may be bothersome. The tray table is in the armrest, making the armrest immovable and slightly reducing seat width. There is no floor storage for this seat during take-off or landing. 42 A None No Power Seat 42 A is an Economy Class seat in the last row of the plane that may not recline. The close proximity to the lavatories may be bothersome. 42 C None No Power Seat 42 C is an Economy Class seat in the last row of the plane that may not recline. The close proximity to the lavatories may be bothersome. 42 D None No Power Seat 42 D is an Economy Class seat in the last row of the plane that may not recline. The close proximity to the lavatories may be bothersome. 42 E None No Power Seat 42 E is an Economy Class seat in the last row of the plane that may not recline. The close proximity to the lavatories may be bothersome. 42 G None No Power Seat 42 G is an Economy Class seat in the last row of the plane that may not recline. The close proximity to the lavatories may be bothersome. 42 H None No Power Seat 42 H is an Economy Class seat in the last row of the plane that may not recline. The close proximity to the lavatories may be bothersome. 42 K None No Power Seat 42 K is an Economy Class seat in the last row of the plane that may not recline. The close proximity to the lavatories may be bothersome. 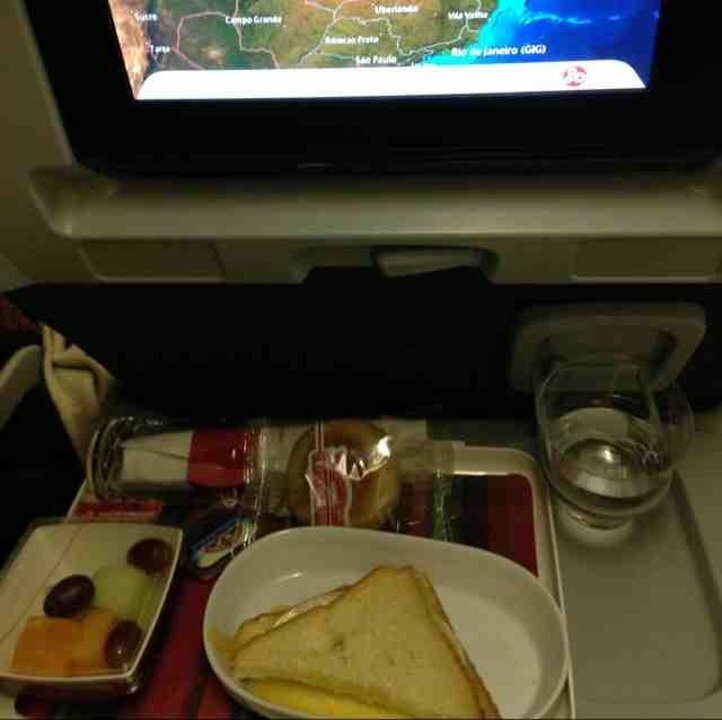 Hot meals and bar services are available for all long-haul flights. 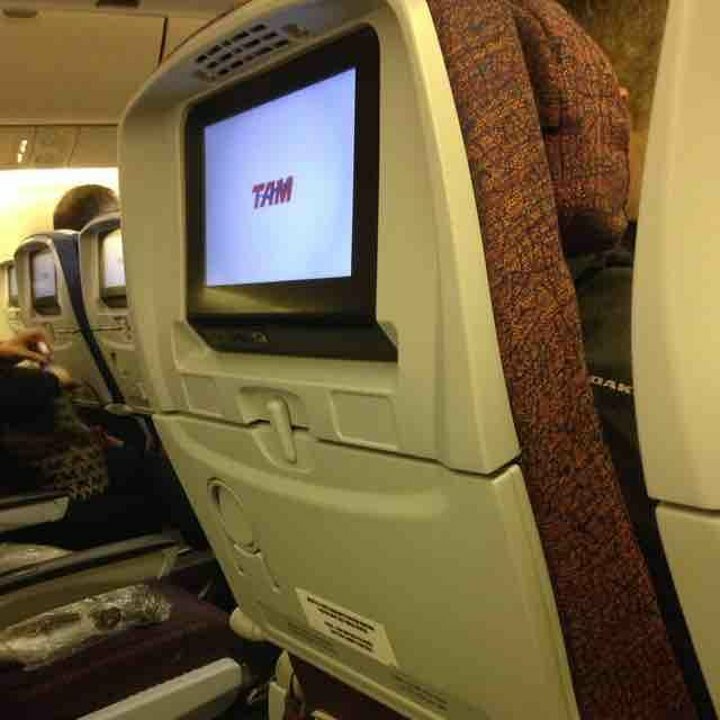 LATAM flies the Boeing 767-300ER with 205 seats in a two-class configuration of Business and Economy. 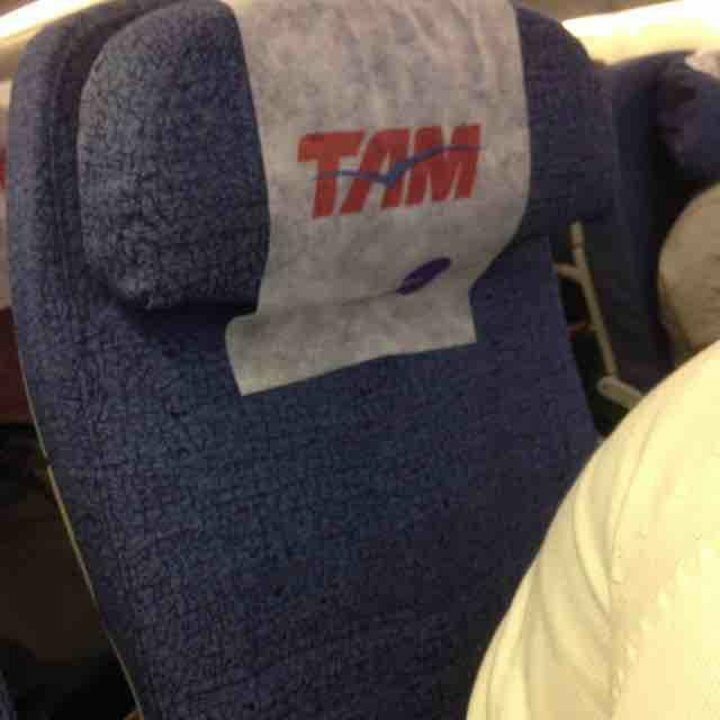 There are Space + seats in row 14, which LATAM charges an extra fee to reserve. Space + seats are an Economy Class product that offer passengers greater seat pitch if they choose to purchase it. 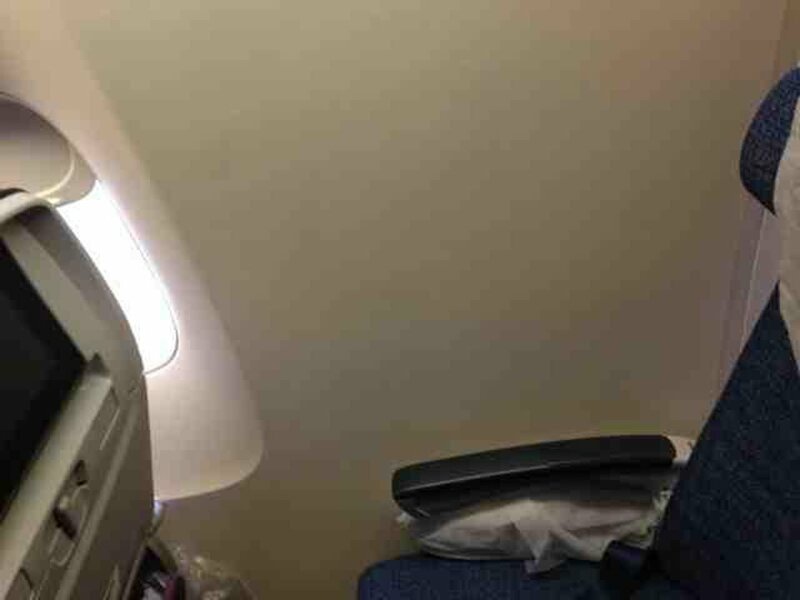 Although this seat has no direct window, it's still easy to look out of the window just forward of it. On 11-hour flight from JNB-GRU nothing to look at anyway. Seat is very comfortable, full-flat seat. Large duvet and pillow are totally adequate. Easy to step over aisle seat. 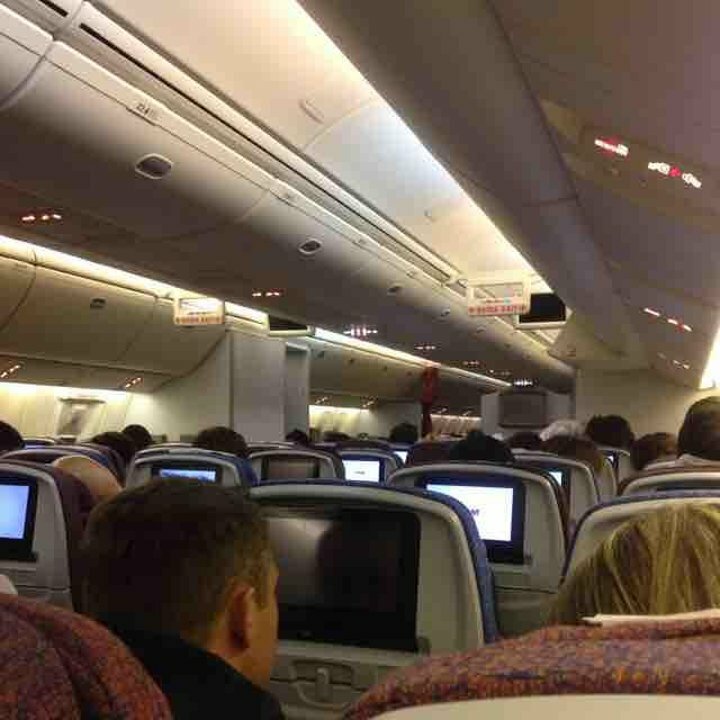 TV screens are in seat back and could be larger, but OK. Cabin service on LATAM is outstanding.